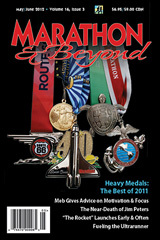 Marathon & Beyond is available at Barnes & Noble and Borders bookstores and many other magazine specialty shops. In addition, the following running stores carry M&B (listed alphabetically by state, then country). If a bookstore or running store near you does NOT carry M&B, have them contact us at toll-free 877/972-4230.